Stock up for the holidays with these specials! The holidays are upon us and we’re sure many of you have a packed social calendar. Fortunately, Bridge Liquors is here to help. If you’re hosting a party, remember that we can provide free delivery to your home or business. Give us a call at (401)848-9200 to place your order. There is a $40 minimum and we ask for a few hours advance notice on large orders. Bridge Liquors will match any local competitor’s advertised prices. Just show us the ad and we’ll match it. Newport, RI, your favorite liquor store has some great deals on beer, wine and spirits! As Thanksgiving approaches, we at Bridge Liquors are making big preparations for what is our biggest day of the year. We’ll be open until 11pm Thanksgiving Eve, but closed on Thanksgiving Day, in accordance with Rhode Island law. This means you’ll need to plan ahead and take advantage of some of our great deals this week! Oh, and just a quick reminder that Bridge Liquors will match local competitors’ advertised prices. In the slim chance that you find a lower price than what we have on offer, just present the ad and we’ll match it! As always, come in to check out our massive selection of craft beer and all of our 99 cent nips! Summer has left the building, but have no fear, Bridge Liquors is ready to offer Newport, RI great deals on beer, wine and liquor! It’s that time when shorts are becoming an odd choice to wear outside and people are breaking “jackets” out of their closets, because fall it upon us. With fall comes some great deals for Newport at Bridge Liquors. Cases of 24 cans are just $19.99. New Belgium has arrived in Rhode Island and Newport…and Bridge Liquors. “Yes, we have Fat Tire.” That’s an answer that we at Bridge Liquors have been wanting to give for almost a decade. Customers would come in and look at our craft beer selection and then ask if we had any Fat Tire. This conversation was repeated at least once a month for the last seven years…right up until this past Monday. Hey Newport, RI! It’s a great time to load up on handles of vodka at Bridge Liquors! Vodka is probably the most versatile of liquors. You can mix it with pretty much anything or drink it straight. We’ve got some great specials on the big bottles so come on down and stock up! P.A. Smirnoff developed a traditional charcoal filtration method for vodka in Mother Russia. His son Vladimir created “Recipe No. 21” after fleeing the Bolshevik Revolution of 1917 and according to Diageo, it’s the world’s best-selling vodka. It’s available in plastic bottles for those of you who will be boating on Newport Harbor. 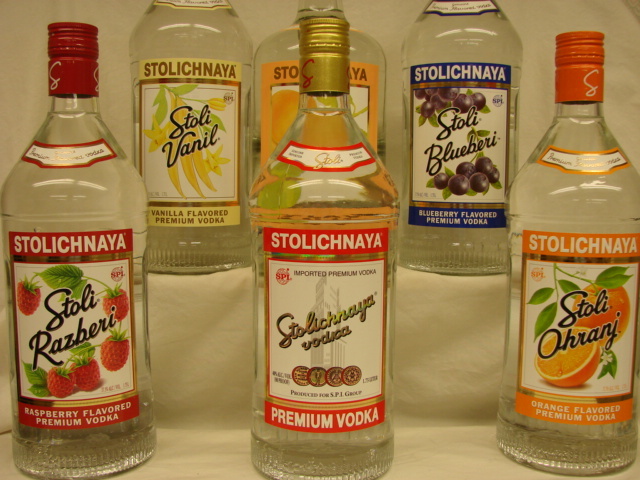 Probably the best thing to come out of Soviet Russia, Stolichnaya starts with wheat and rye grains and artesian water. It is fermented for 60 hours before being triple distilled and then filtered through quartz, sand, charcoal, and woven cloth. 5-times distilled from the finest grains and then triple filtered this vodka is so smooth you can drink it straight up. A selection of Sean Larkin’s Revival Brewing’s craft beers are now available in Newport, RI. Craft brewing in Rhode Island is a young industry, so Revival Brewing’s founding in 2011 makes it one of the state’s most mature breweries. As has often been the case with small Rhode Island breweries, availability in Newport can be a challenge, but we’ve just secured a nice big drop and are happy to have a big variety of Sean Larkin’s beers on sale at Bridge Liquors. Here are the beers that have just arrived and are available as of this posting. Celebrating National Beer Day with the Craft Beer Guild’s newest beers. Thursday at Bridge Liquors means it’s Craft Beer Guild day. April 7th means it’s National Beer Day, celebrating the end of Prohibition some 83 years ago. More craft beer hits the shelves in Newport. It’s always exciting when a new brewery gets distributed in Rhode Island, but Boulevard Brewing is one of the big breweries whose absence was noticeable, especially for beer drinkers who’d spent any time elsewhere in the country. For those of you who have never heard of Boulevard, it’s part of Duvel Moortgat USA. Duvel, as some of you might remember, is one of Belgium’s most famous breweries. They’ve expanded stateside with Ommegang in New York and they purchased Boulevard in 2013. While Ommegang maintains a Belgian-style identity, Boulevard does everything.